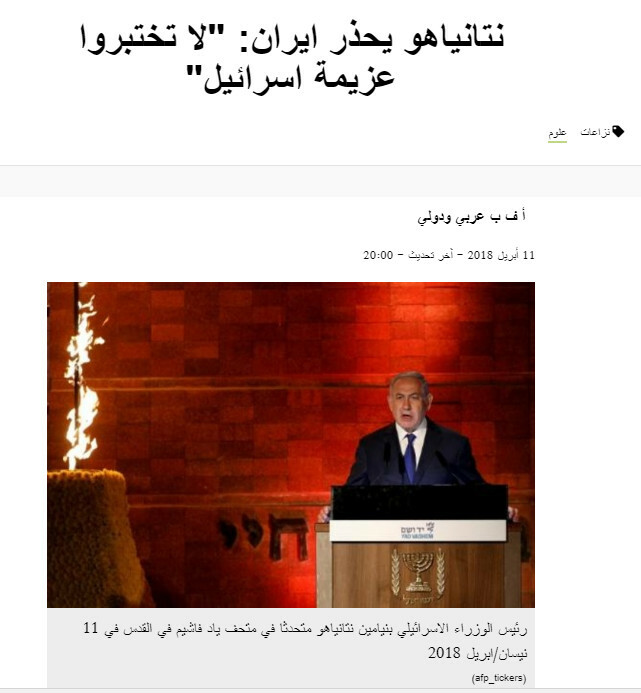 Tonight, only two hours ago, Israel's prime minister Benjamin Netanyahu made a great show in a life broadcast to the world when he presented lots and lots of documents belonging to an Iranian nuclear program named "Project Amad". 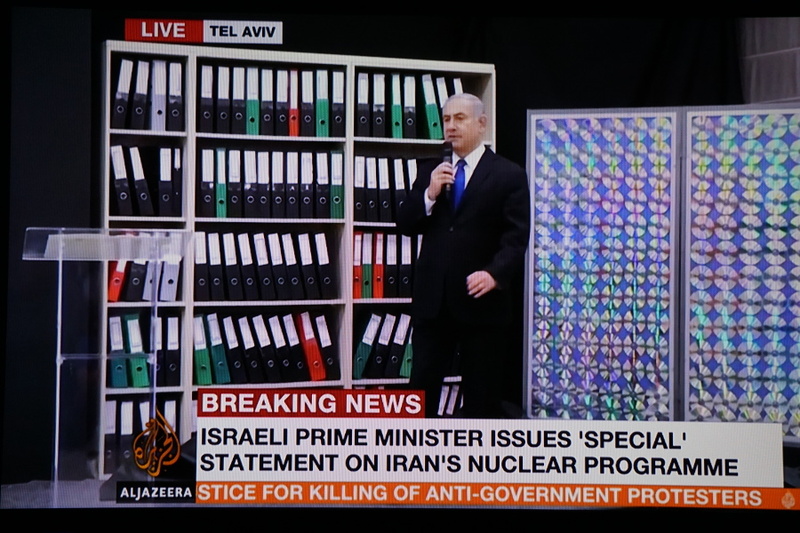 These documents, having become obsolete after Iran signed the denuclearization treaty, were recently relocated and stored in a shabby hut in the outskirts of Tehran. From there they must have been stolen by Israeli agents. But first some words about Israel's own nuclear weapons. Their existence had much earlier been indicated by some cryptic answer given by deputy-defense minister and later president Peres to former US president Kennedy when Kennedy had inquired into Israel's nuclear ambitions: "I can assure you that we won't be the first to apply nuclear weapons". 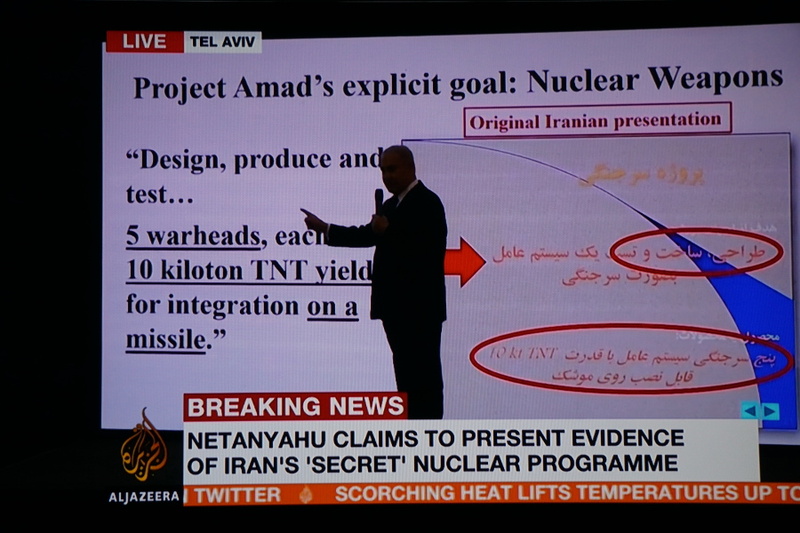 You should keep this in mind before you turn to Netanyahu's "breaking exposure" of an Iranian nuclear program. Netanyahu playing into the hands of US president Trump. 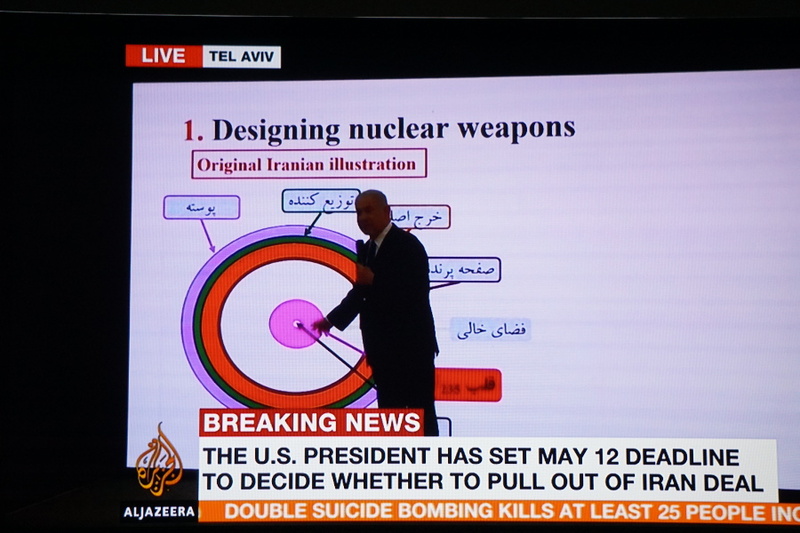 And by the way, I still remember that Saddam Hussein's administration in Iraq kept some similar feasibility study for a nuclear weapon and which was abandoned after Israel had bombed Saddam's secret research reactor into a ruin. 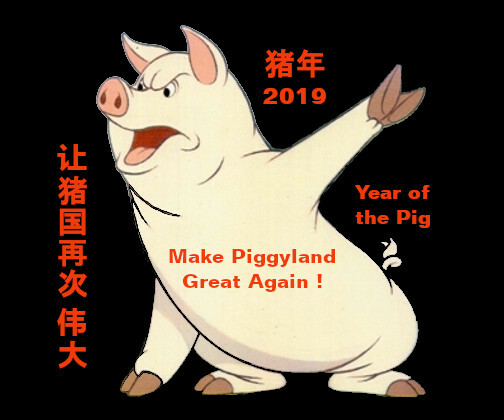 That study became known only by chance when the Bush administration published masses of unchecked documents on the internet, in the hope US patriots would volunteer with their Arabic language skills to participate in the translation which surpassed government capacity. 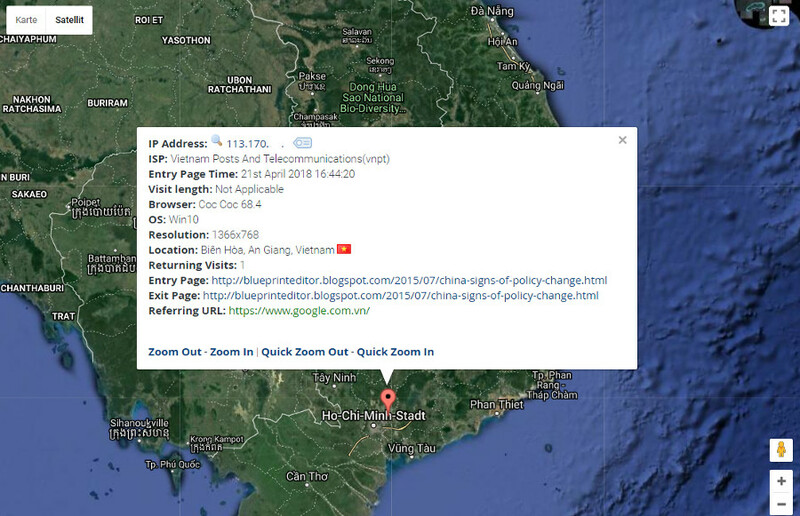 When some reader sounded the alarm, the web portal was closed in a hurry. 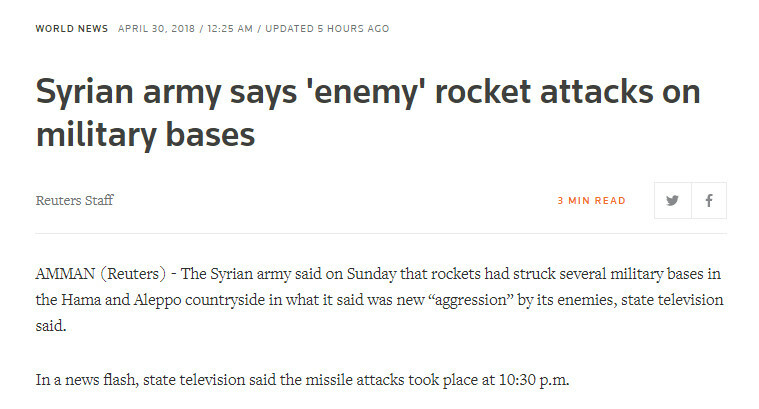 In a news flash, [Syrian] state television said the missile attacks took place at 10:30 p.m.
An opposition source said one of the locations hit was an army base known as Brigade 47 near Hama city, widely known as a recruitment center for Iranian-backed Shi’ite militias who fight alongside President Bashar al-Assad’s forces. counting on an Iranian revenge. [in comparison with] other fronts. in Hamaa and Aleppo countryside attacks. 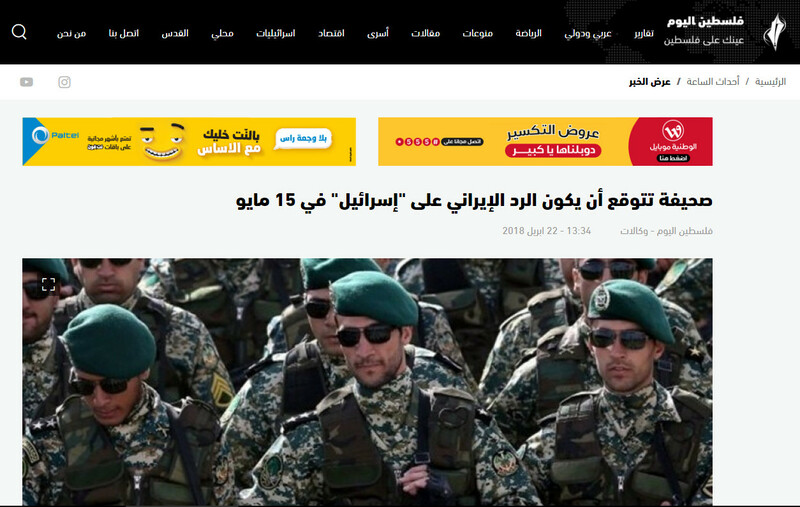 A Syrian military source said there is no certitude up to now about the killing of Iranian soldiers in the missile attack which targeted the region of Hamaa and Aleppo last Sunday night. 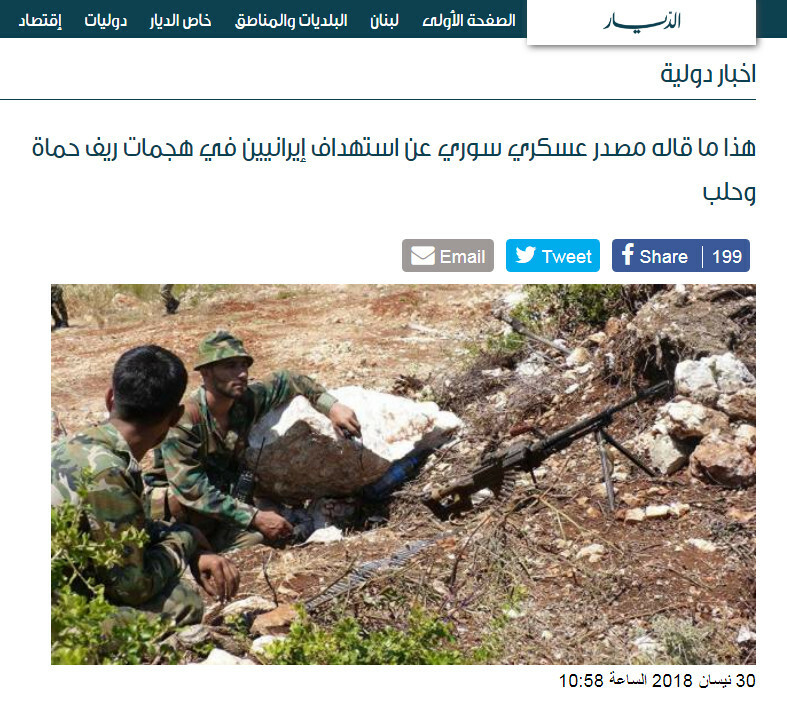 As a source ["from the battle ground"] told the office of [Russia's news center] "Sputnik", the blows had been targeting an ammunition depot in the region of Hamaa belonging to "brigade 47" of the Syrian army and had resulted in the death of 12 soldiers and a big number of wounded in the garrison. Editor's Note: As published numbers of the dead and wounded after the above described Israeli attacks are steadily rising, I decided to refrain from any "bodycount update". 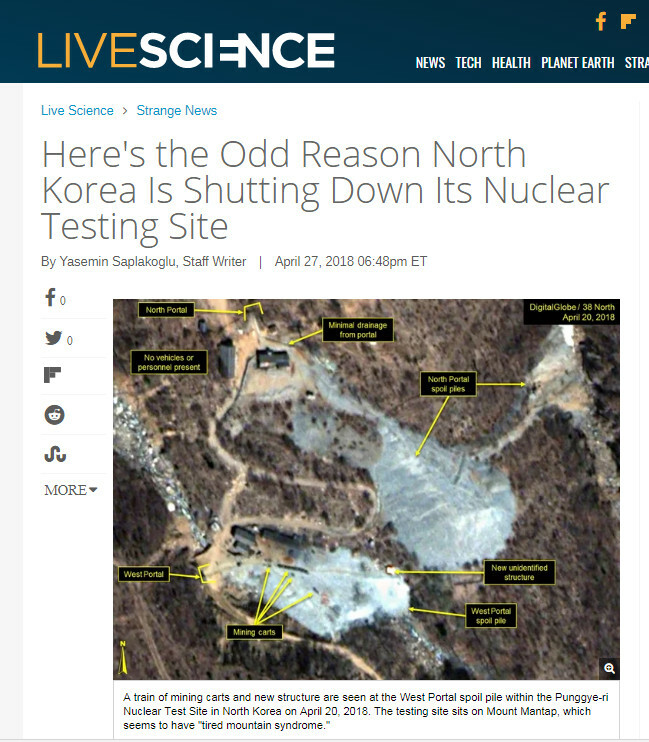 Last week North Korea announced it will cease all nuclear testing and will be shutting down its main testing facility at Mount Mantap. Although some believe the decision came because of easing tensions between the country and the world, others think Mount Mantap may have come down with a bad case of "tired mountain syndrome." But what exactly is tired mountain syndrome, and how does a mountain "catch" it? [Iran's ambassador to the United Nations] Khoshroo criticized the United States and other members of the [UN security] council for granting Israel a sense of "exceptionalism" that has allowed Tel Aviv to constantly undermine peace in the region without ever having to worry about the consequences. 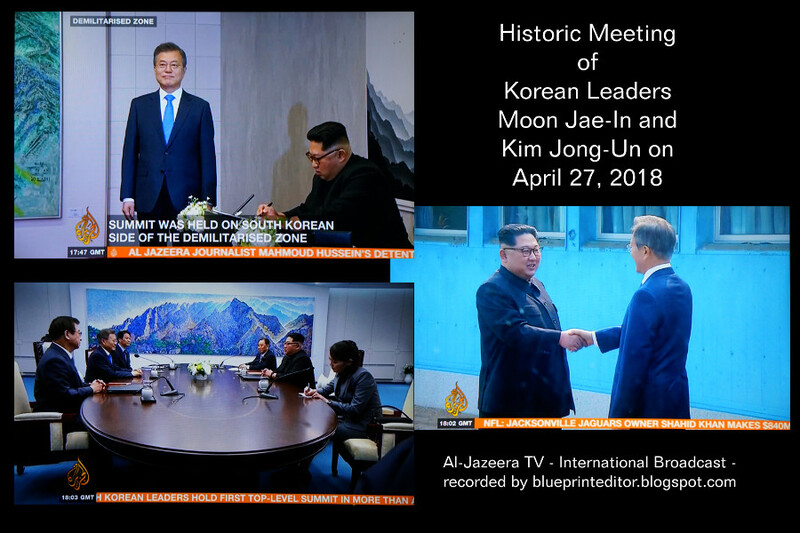 "The impunity this regime has enjoyed for so long wouldn’t have been possible without the help it receives from the US and certain interest groups," he added. The Israeli military said two shepherds had crossed the U.N.-demarcated border with Lebanon and that one of them was taken into custody by its troops. Between Hezbollah and Israel - An Imminent War is Looming on the Horizon. 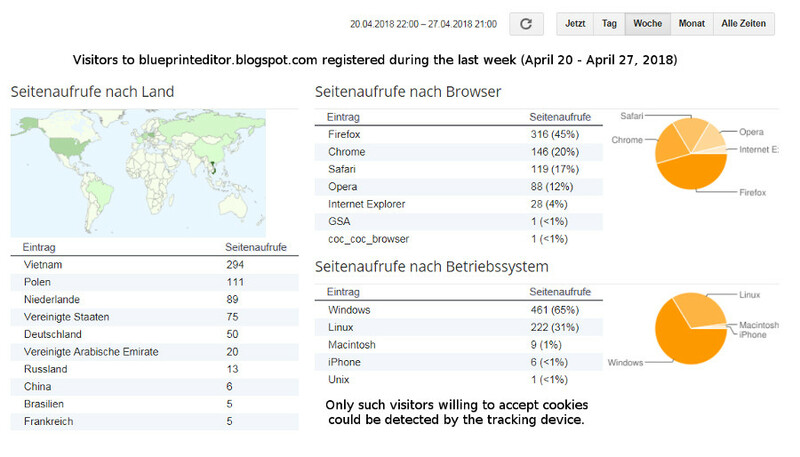 Visitor statistics of "blueprint news" during the last week. most serious defeat for the United States. US visitor interested in North Korea. Last Update: 26 April in the evening. 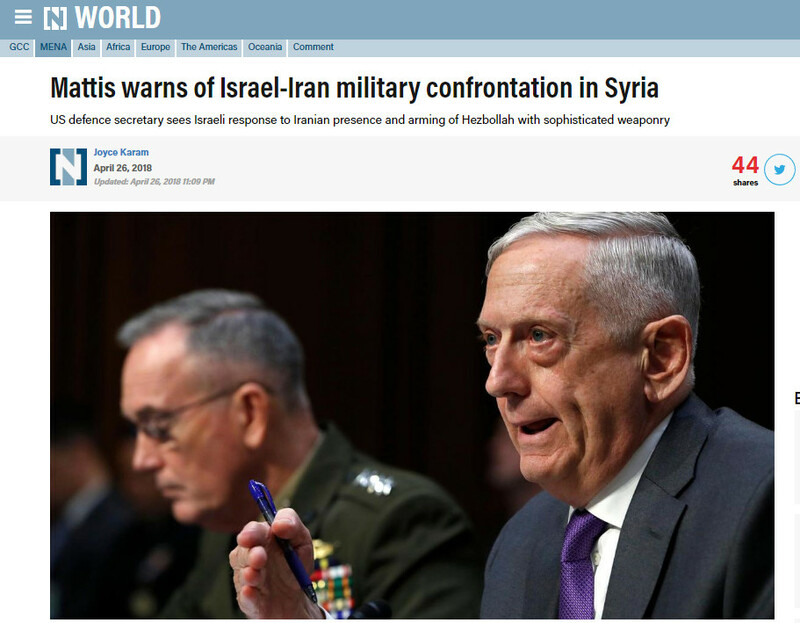 A military confrontation between Israel and Iran in Syria is becoming increasing likely, US Defence Secretary James Mattis warned on Thursday [26 April] as his Israeli counterpart was visiting Washington to discuss the threat. "Any site in which we see an Iranian attempt to achieve a military foothold in Syria will be struck. We won't let that happen, regardless of the price," he told the [Saudi owned] Arabic news website Elaph. Proxi-war between Iran and Israel looming. consolidating their presence in Syria. Tel Aviv: Tehran [must not cross] the "Red Line". Russia: Air defense of Hamimim base downed unidentified [propelled] targets. Russia's ministry of defense announced that its air defense at Hamimim base downed small sized propelled targets without [suffering] human or material damage. 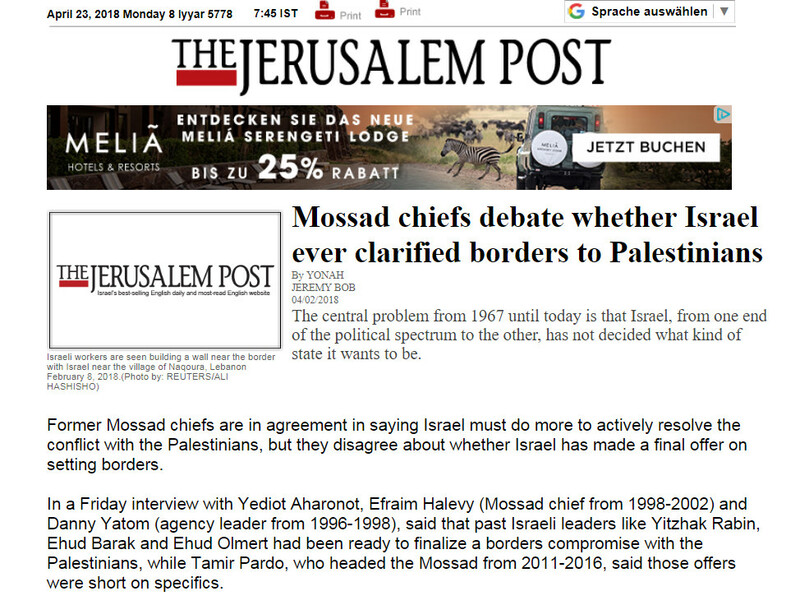 In an interview with the Jerusalem Post the former chief of Mossad, Danny Yatom, spoke about the "Iranian Threat". That interview was published some days ago on 15 April. One special point mentioned here is the Iranian drone which had entered into Israel and had been destroyed by Israeli forces. As Yatom puts it, the unmanned object was armed with explosives and was an almost identical replica of some US drone that had fallen into the hands of Iranian military much earlier. If such drone had exploded in Israel, it would have been difficult to directly relate the attack to Iran or its ally Hezbollah. Russia plans to deliver an anti-aircraft missile system, known as the S-300, to Syria in the near future, Russian Defense Ministry’s Colonel General Sergei Rudskoi told reporters on Wednesday [25 April]. 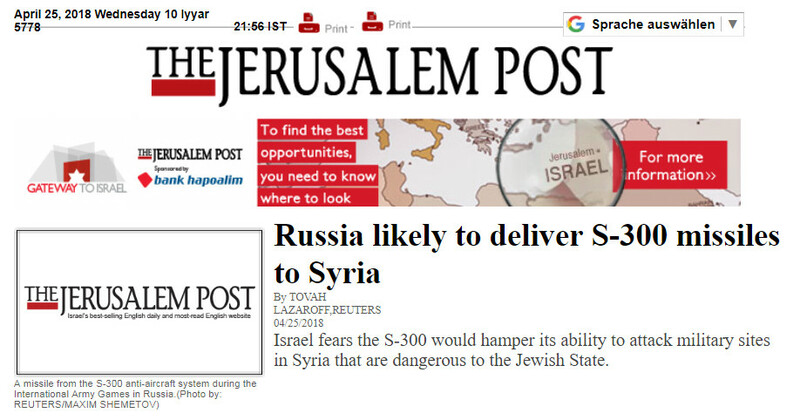 [Russia's ambassador to Israel] Shein said the idea of the S-300 delivery - on which Russia has yet to decide - was a result of the punitive April 14 missile strikes by US, British and French forces on Syria. 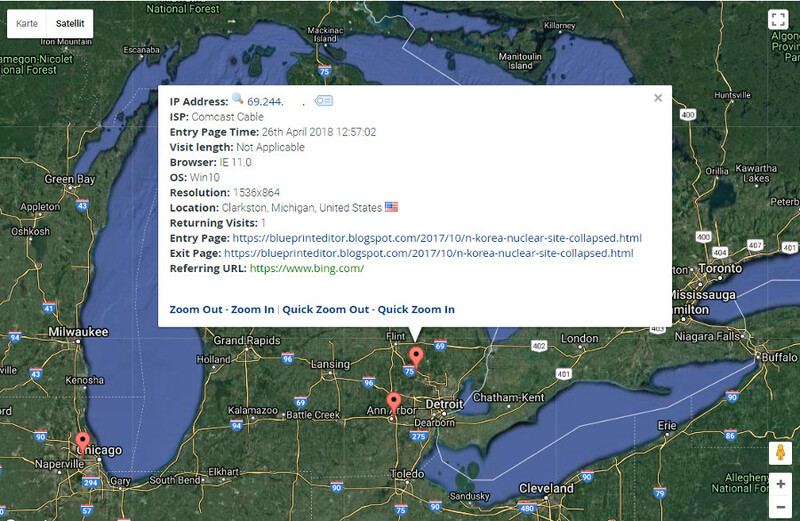 Editor's Note: An earlier blogspot of "blueprint news" already reported about Russian plannings to support Syria with the installation of a missile production near some Russian base. could lead to an extended war and Israel's biggest mobilization. 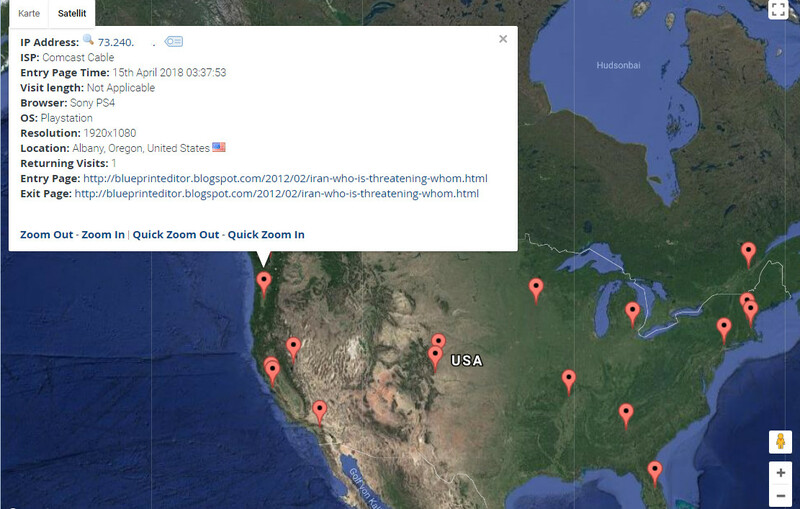 Recent visitors to "blueprint news". 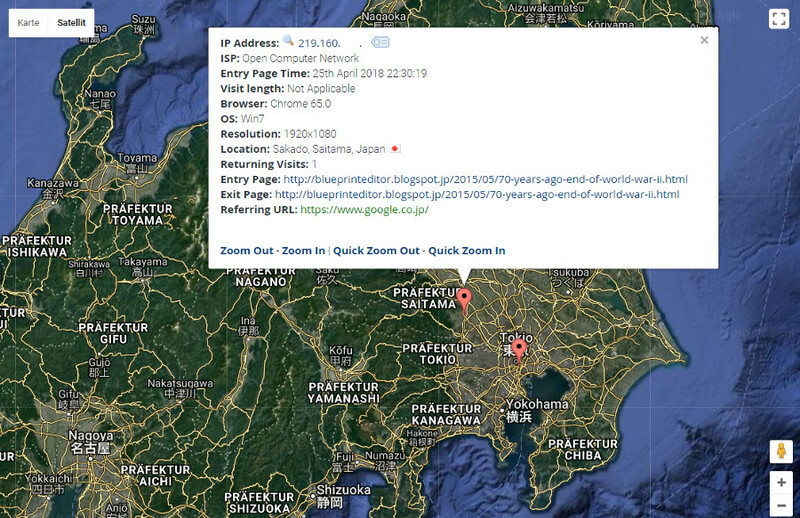 Visitors from Japan and Russia are referring to World War II. While Israel is officially celebrating the 70th anniversary of its existence, a debate is rising on the failure of former Israeli governments to come to terms with Israel's Palestinian neighbours. The blame is being put especially on the actual administration of prime minister Netanyahu who is furthermore accused of turning the eyes of the public away from his own corruption scandal to an immediate danger from Iran. 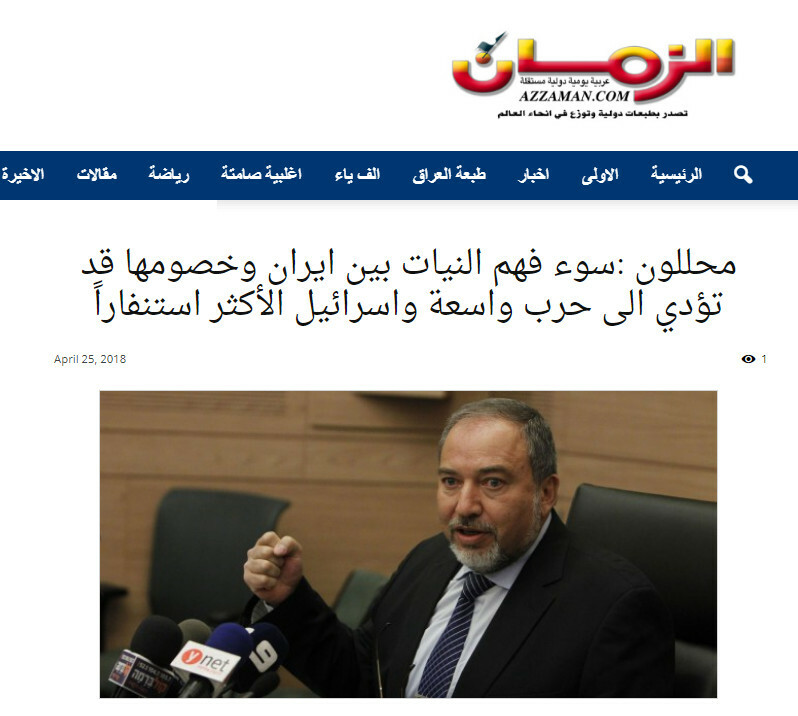 An Arabic broadcast by Al-Jazeera in Qatar two days ago reminded of King Hussein of Jordan who had become a reliable friend to Israel's former prime minister Yitzhak Rabin during their negotiations when both politicians had tried to solve the regional problems between Jews and Palestinians. This, however, ended with the assassination of Rabin in 1995, committed by an ultranational Jew with relations to the environment of Israel's secret service Mossad and who therefore succeeded to come close enough to his victim. During the lifetime of Rabin the militant confrontation between Palestinian citizens and Israeli soldiers came to a halt. 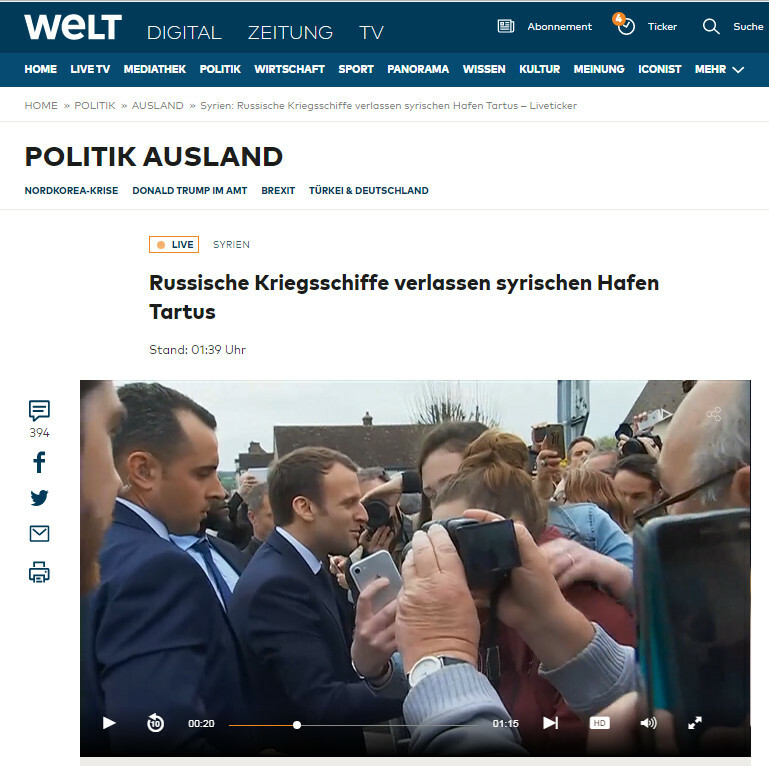 I still remember some German TV report from that time where Palestinians declared that even their children had stopped throwing stones at soldiers and which had become a traditional amusement since the foundation of the Jewish state. 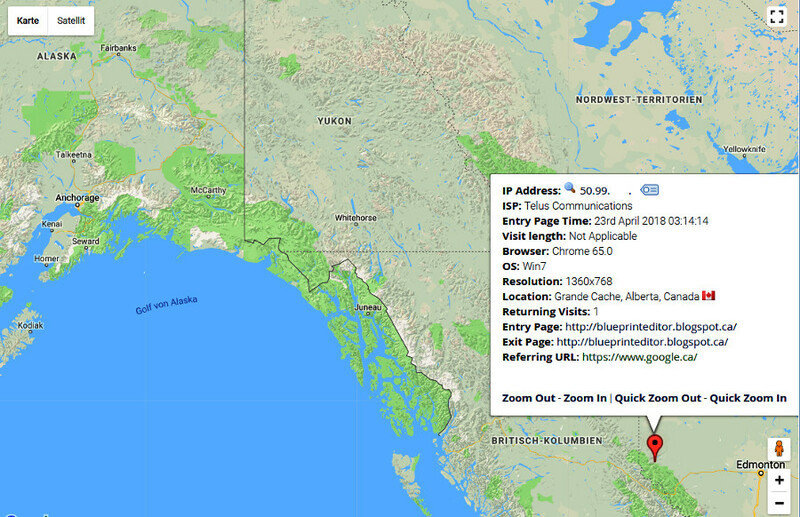 Canadian visitor to "blueprint news" based near the Gulf of Alaska. The Israeli Air Force has decided to scale back its participation in the Red Flag exercise in Alaska amid increasing tensions on Israel’s northern border. 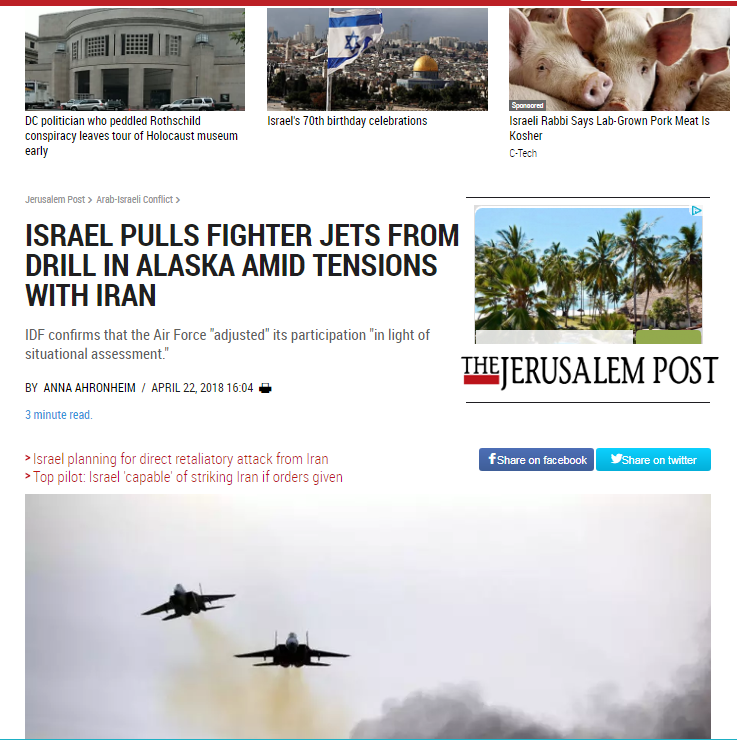 According to a statement by Air Force public affairs officer Kitsana Dounglomchan, Israel’s Air Force decided not to send F-15 fighter jets to the two-week-long drill, which will run between April 26 - May 11, out of Eielson Air Force base in Fairbanks and Joint Base Elmendorf-Richardson in Anchorage. Israeli Navy names new SA'AR 6 warships arriving from Germany. On Sunday, Israeli Navy Commander Maj.-Gen. Eli Sharvit announced that the four ships would be named "Magen," "Oz," "Independence" and "Triumph". The decision on the names was determined by a forum headed by the Navy, led by Sharvit. Israel is highly dependent on the sea, with over 90% of Israel’s imports arriving via the sea, and while the country’s navy is relatively small compared to other IDF corps, it has a significant amount of territory to protect since the expansion of the country’s exclusive economic zone (EEZ) from 40 miles to 150 miles from shore years ago. “You can how see the ships are taking shape these days,” Sharvit said. “The arrival of the ships is expected to significantly change the face of the Navy." “The Navy will employ tools with new capabilities that we do not possess today with excellent and precise defense and attack capabilities for their mission, headed by the defense of the strategic assets of the State of Israel at sea,” he continued. The construction of the four “Sa'ar-6” class warships was agreed to in a 430 million euro deal between Israel and the German company ThyssenKrupp in 2015. The first ship is expected to arrive at the end of 2019 with the last by 2021. Existing Sa’ar-5 and Sa’ar 4.5 ships are being upgraded with the integration of new radars and electronic warfare systems, Israel is set to receive new Dolphin-class submarines and new Sa’ar-6 Corvettes in coming years which are set to be operational by 2021. 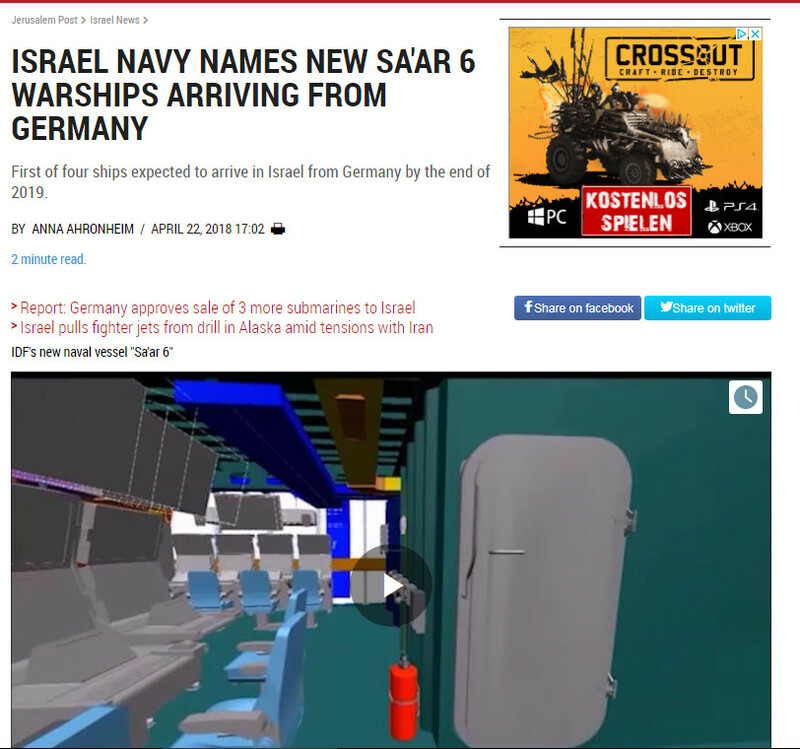 The Sa’ar 6 will have a crew of 70 sailors, a range of 2500 miles, and advanced capabilities able to deal with a wide range of threats including Iron Dome short range defense missile launchers and Barak-8 long-range surface-to-air missile naval defense system. They are set to defend Israel’s offshore natural gas reserves as well as other strategic maritime assets. ..... and some submarines in addition. 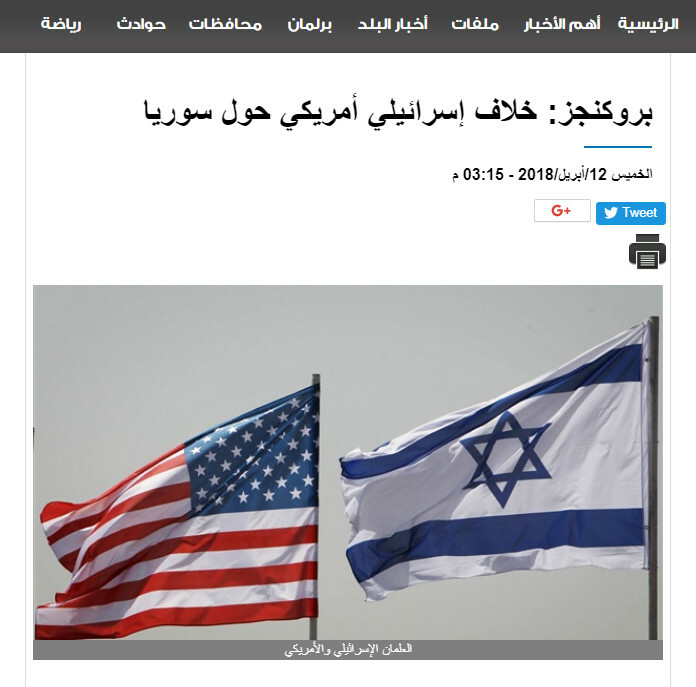 Some journal predicts the Iranian response to "Israel" for May 15. Israel - Iranian Attack Imminent ? 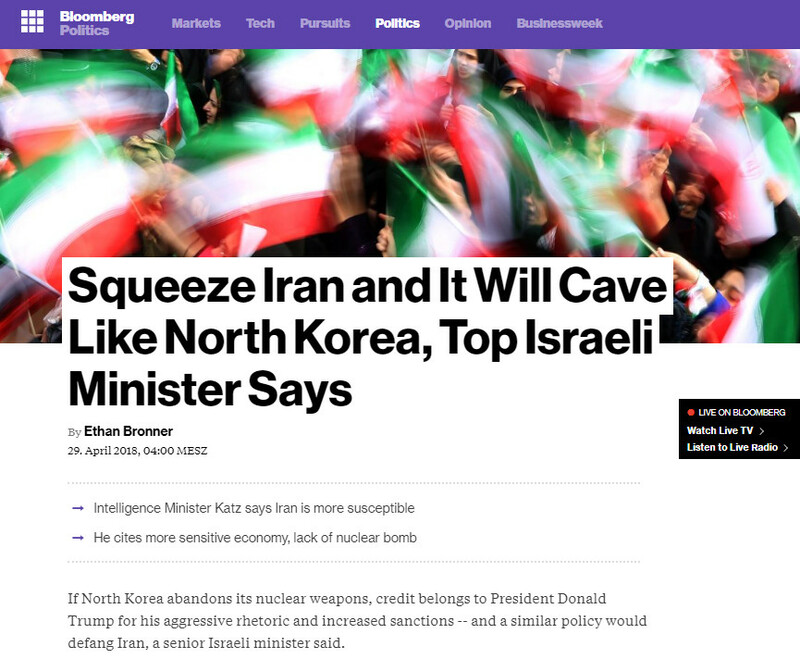 New York Times : Iranian blows on Israel are imminent. Some security source revealed an imminent operation that presents itself as an Iranian attack on Israel by unmanned aircraft. 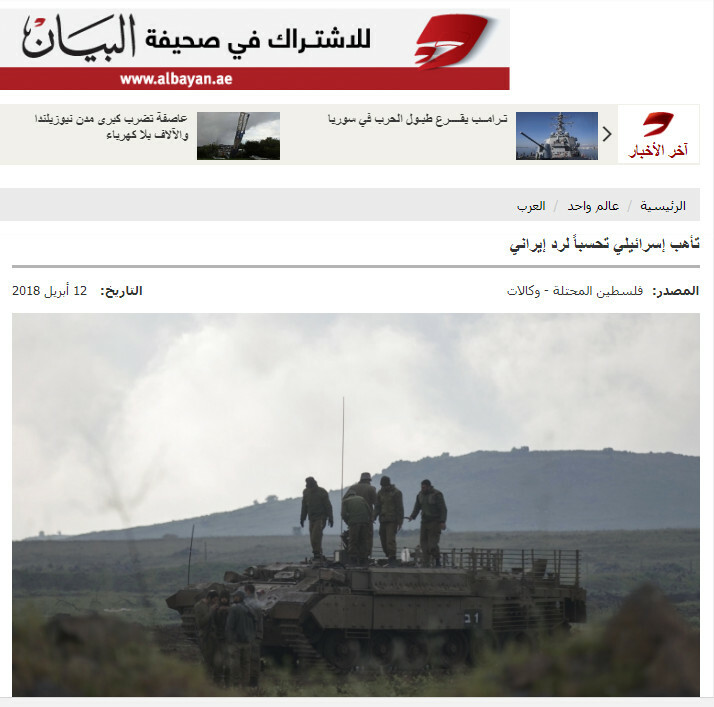 The newspaper quoted the Israeli " Yediot Aharonot " as saying that the source which did not mention its name is warning that " Israel will respond strongly to any Iranian retaliation operation against it from Syrian territory ", indicating the possibility that Iran went inside Israel to strike with unmanned aircraft. 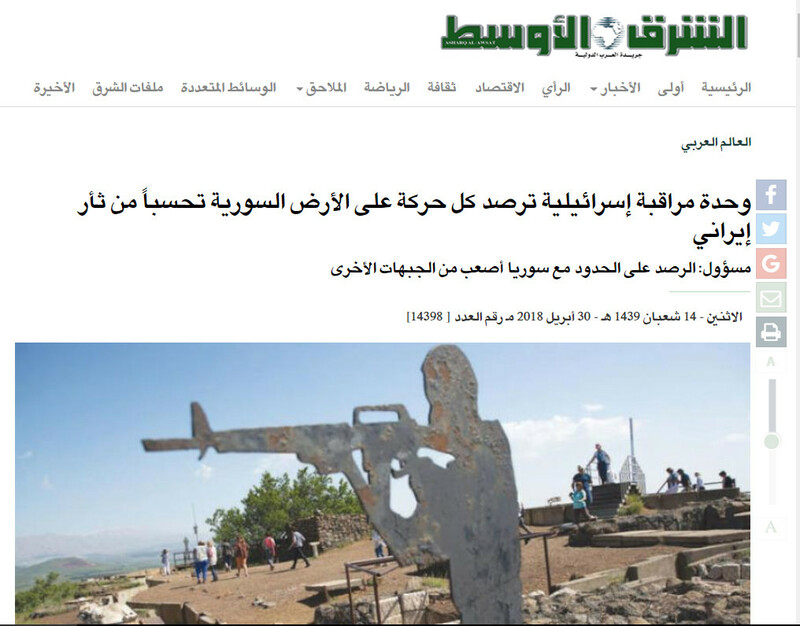 There are other Arabic news centers that published similar information at about the same time. But remember: This news is of Israeli origin and has not been confirmed by independent sources so far. Russia proposes to support al-Assad in the installation of a missile production site near Russia's military base in the coastal area. Israel struck an Iran-operated air base in Syria, a senior Israeli military official confirmed on Monday, as Israeli sources reported that Israel sent a clear message to Russia that the sale of the advanced S-300 missile defense system to the Syrian regime will cross a red line. 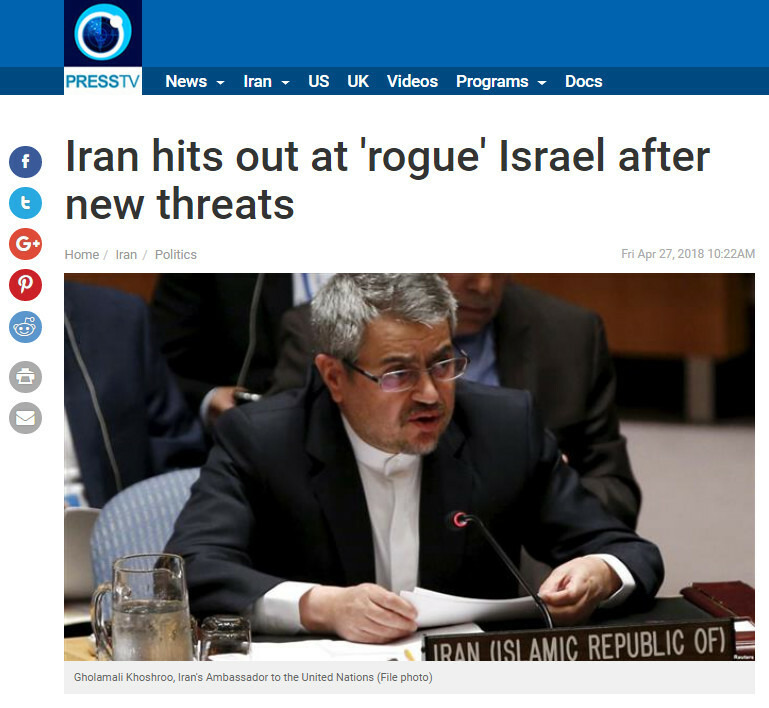 Meanwhile, Iran's Foreign Ministry spokesman Bahram Qassemi said his country will sooner or later respond to the recent crime and aggression of Israel. 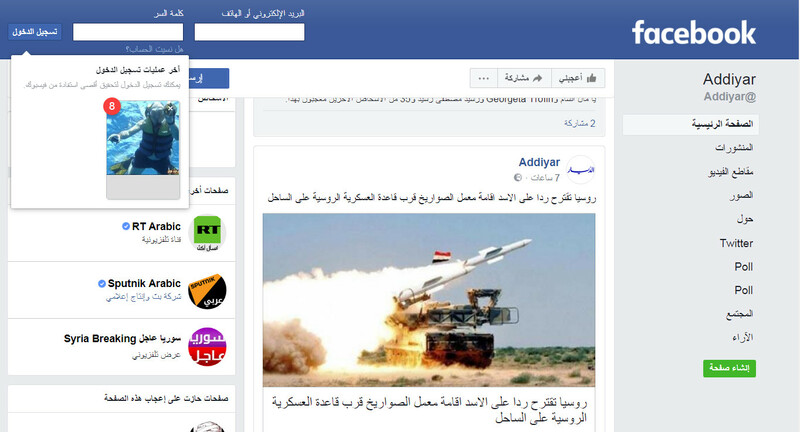 It was the first time we attacked live Iranian targets in Syria, both facilities and people, the Israeli military source admitted to New York Times. 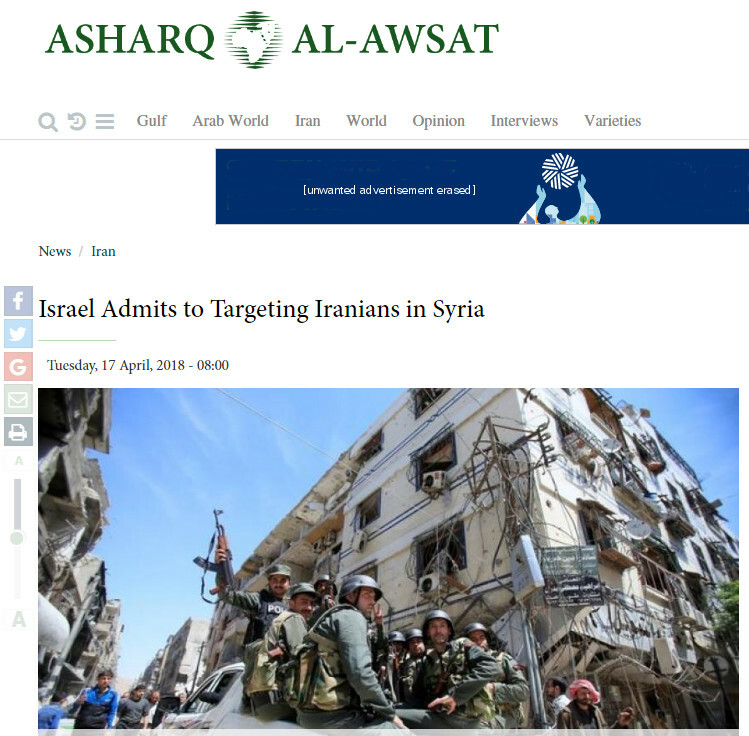 This is the first time an Israeli official admits to directly targeting Iranian forces in Syria, given that Israel usually refrains from commenting on any reports about targets. The official indicated that Israel targeted the Iranian drone command center at the T4 air base in Syria on Monday, in response to an Iranian drone entering Israeli airspace earlier in Febraury. 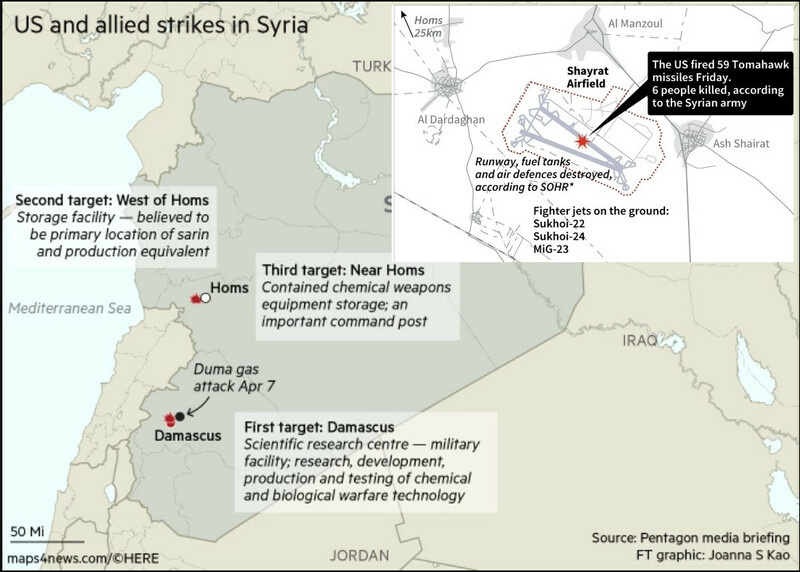 During the attack, Israel killed 14 people, seven of which were Iranian advisers, including a Colonel who led the drone unit operating out of T4, east of Homs. 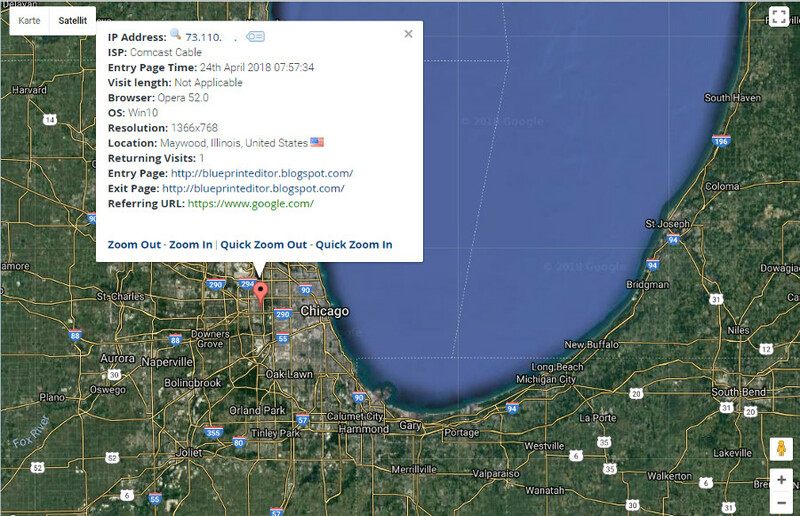 That's the attack "blueprint news" already referred to in an earlier blogspot. It should have taken place on Monday 9 April 2018. The official noted that the armed Iranian drone that entered Israeli airspace "opened a new period," saying that “this is the first time we saw Iran do something against Israel, not by proxy." This was the second time T4 was targeted. 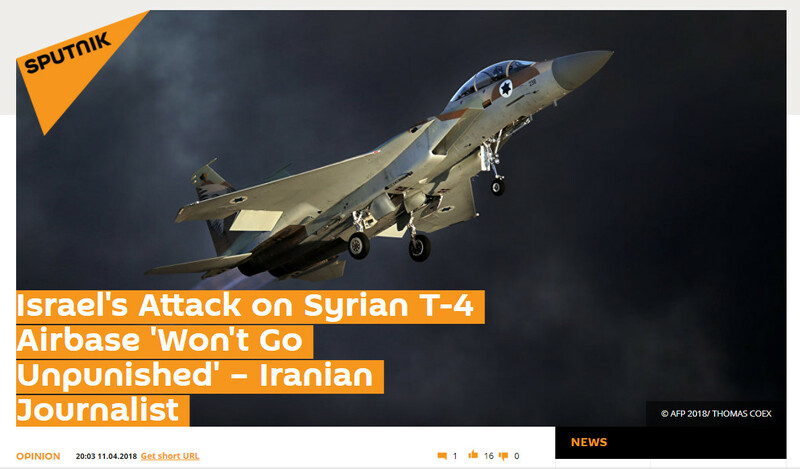 Round one occurred on February 10, when an Iranian drone launched by a Revolutionary Guards Force operating out of Syria’s T4 air base was shot down with a missile from an Israeli Apache helicopter that was following it after it penetrated Israeli airspace. Israeli Media outlets discussed that Israel's admission to the nature of the drone's mission brings the Israeli-Iranian conflict out into public. on a truck in the town of Douma, Damascus area. 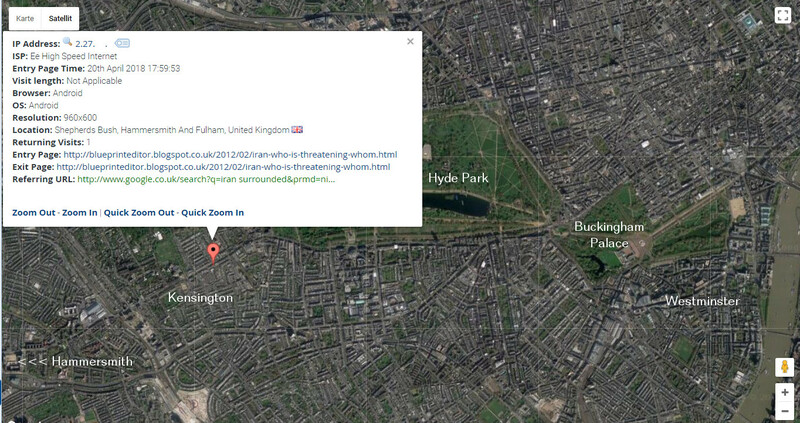 London visitor interested in Iran. This morning US, British and French forces launched an attack on military bases operated by the Syrian national army of president Basher Assad. Three attacks were intended to disable Syria's capability to apply chemical weapons. US president Donald Trump announcing airstrikes on Syrian military bases. Notification made by Syrian army spokesman on a Damascus TV channel. US airstrike on Syrian base in the outskirts of Damascus. Gunfire and detonations. Turkey: America didn't use Incirlik [air] base to hit Syria. 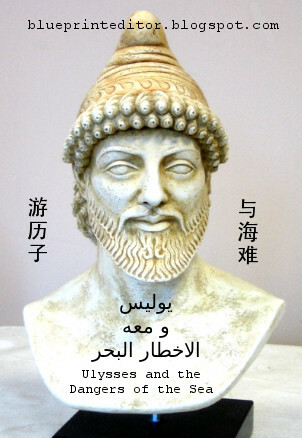 the consequences for its aggressions towards Syria. leadership are imposing a " red line " on Syria. US visitor coming to this site with a Sony Playstation. US president Trump's confusing messages tweeted the day before, led to uncertainty among America's friends and foes. 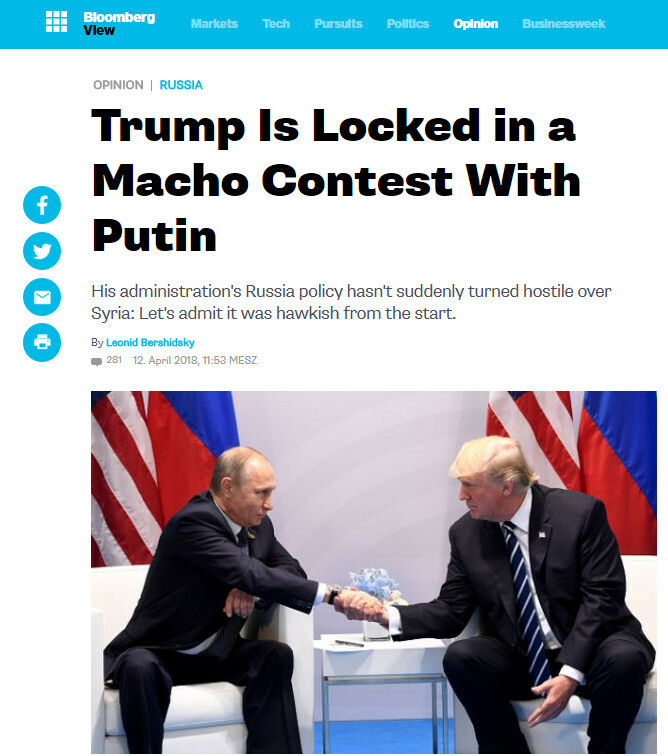 Even if it's only " a macho contest between Trump and Putin " as Bloomberg View put it only some hours ago, there are rising fears that Trump might trigger off a military conflict with Russia, the main ally and military partner of Syria's Assad regime and which is most probably responsible for a chemical warfare scenario effecting many innocent Syrian civilians.
" Alpha males. No longer shaking hands. " The Syrian government and Russian forces in Syria possess truck- mounted surface-to-air missile and anti-aircraft artillery weapons systems. 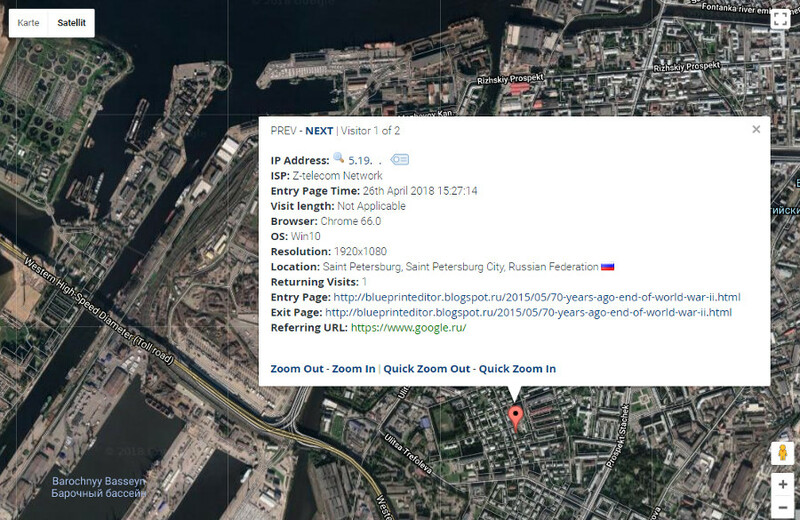 Russische Kriegsschiffe verlassen syrischen Hafen Tartus. Russian warships leaving Syrian port of Tartus. Basher Assad's military used chemical weapons in a populated area. 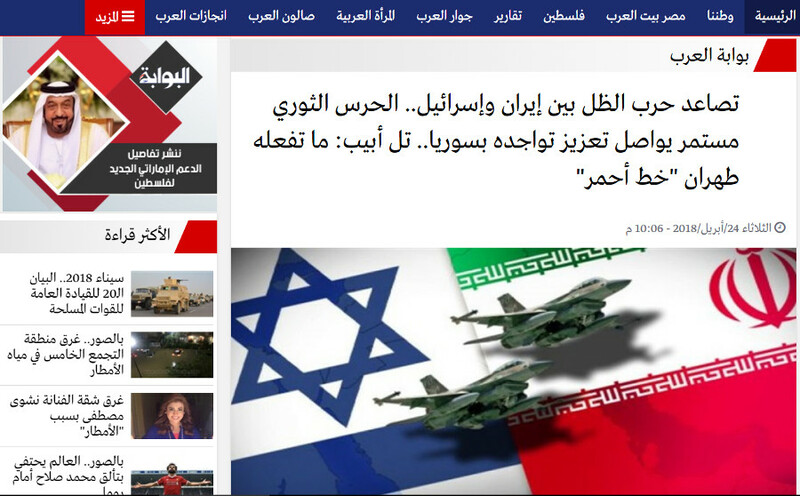 And by the way, there are as well quickly rising tensions between Iran, the other ally of Assad's regime, and Israel. After a recent Israeli air raid that was targeting joint Iranian-Syrian operations, the traditional US partner Israel is now awaiting retaliation from Iran for the death of its military advisers in Syria. 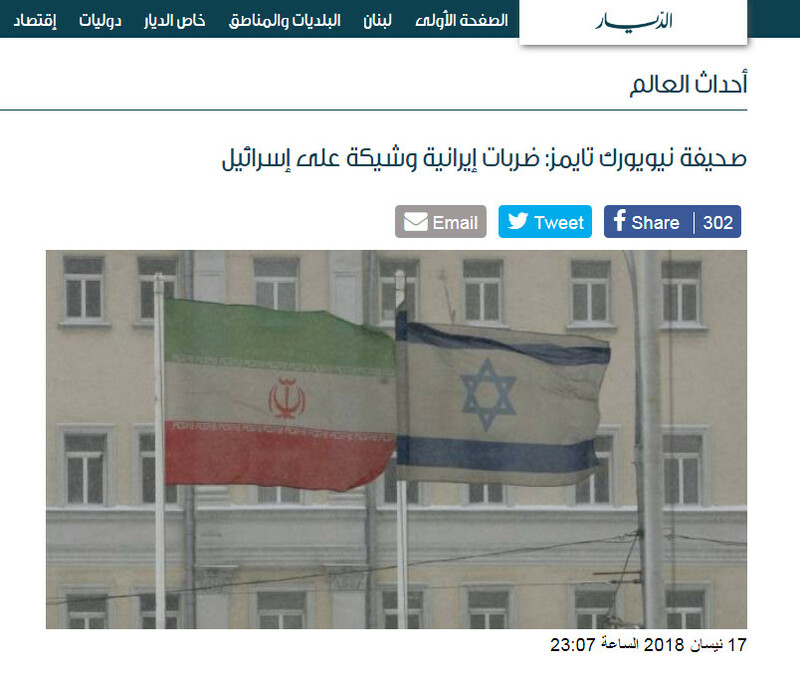 Such, a most dangerous confrontation is building up between Russia and Iran on one side and the US and its proxy Israel on the other side while, at the same time, a chaotic situation results from the absence of clearly defined strategic positions regarding US engagement in the Middle East. 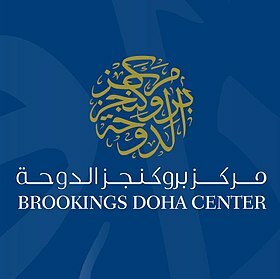 Brookings Doha Center: Disagreement between Israel and the US about Syria. This is referring to a basic disagreement between the US and Israel, particularly with regard to the policy toward Iran and Syria, and which shadowed the relation between both countries during the presidency of Barack Obama. It was the reason for Israel to welcome the election of Donald Trump as Obama's successor. The Brookings Institute of Studies, a US related think-tank, now comes to the conclusion that Trump's policy in the Middle East is essentially the same as Obama's policy, which is essentially about reducing engagement or US involvement in the region's conflicts and thorny issues. 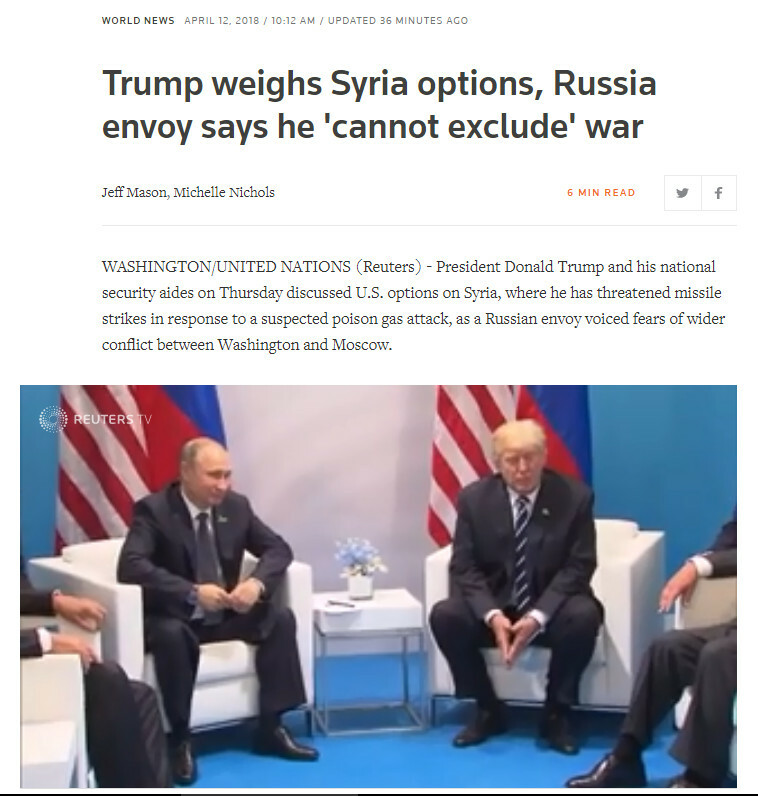 This is marked by Trump's desire to withdraw US troops from Syria. 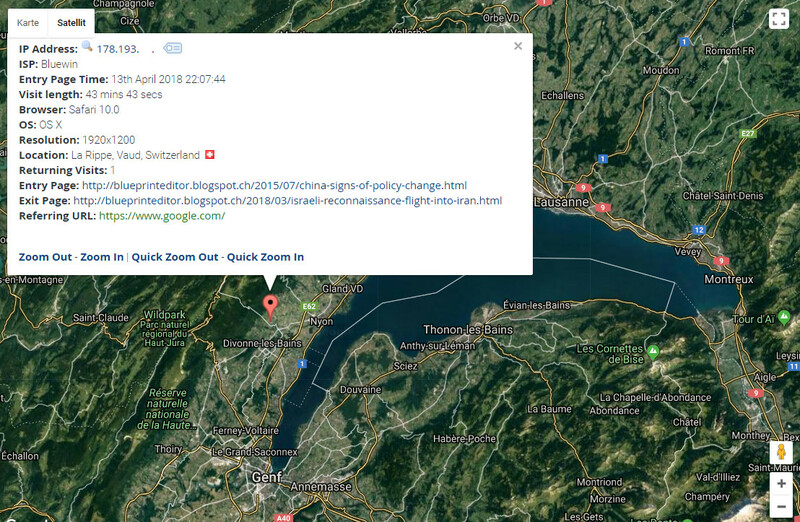 Visitor to "blueprint news" coming from the Lake of Geneva in Switzerland. After an Israeli attack on some Iranian airfield and drone operations facility in Syria and which killed seven military advisers from the Iranian Revolutionary Guards, Israel is now awaiting Iranian retaliation. Iranian sources already made clear that this would not go unanswered. Israel is preparing for a foreseeable Iranian response. Netanyahu warning Iran " Don't test Israel's determination ". and will not allow Hezbollah to score a victory. Russia and Syria are controlling a joint operations room [together] with Iran for regional combat surveillance in Syria and for the observation of airborne movements. 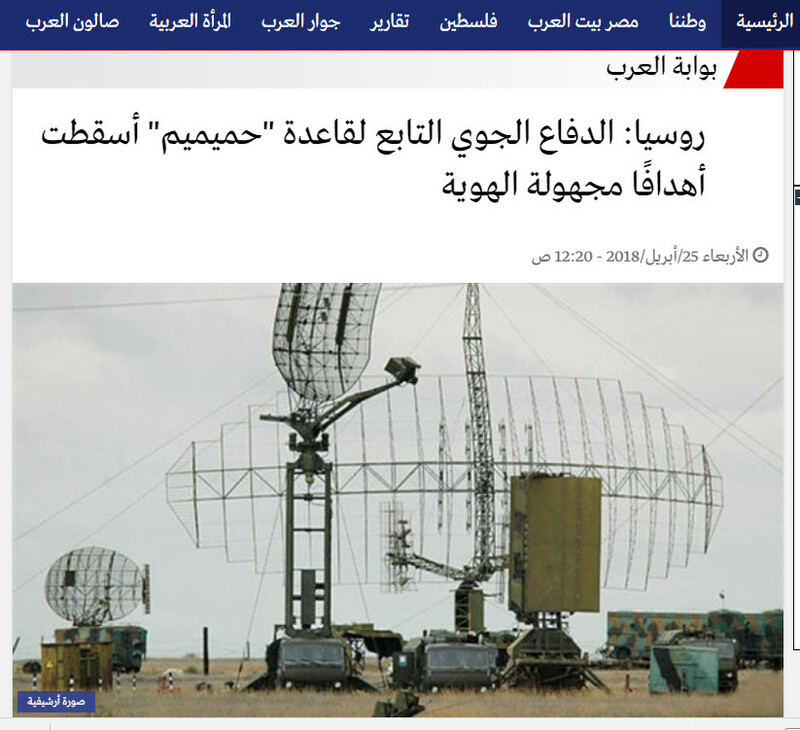 These radar [facilities] are covering the Turkish border, Iraq and the region in North-East Syria which is practically occupied by the US and equally [by] Israel. The surveillance realizes attentively and in real time all jet planes that are leaving military airfields in Israel, including the traffic of the most developed planes - and the most expensive plane in the world which is coming at a price of 112-125 million [US]$ from "Lockheed Martin" into the possession of Israel as F-35 Stealth Fighter. 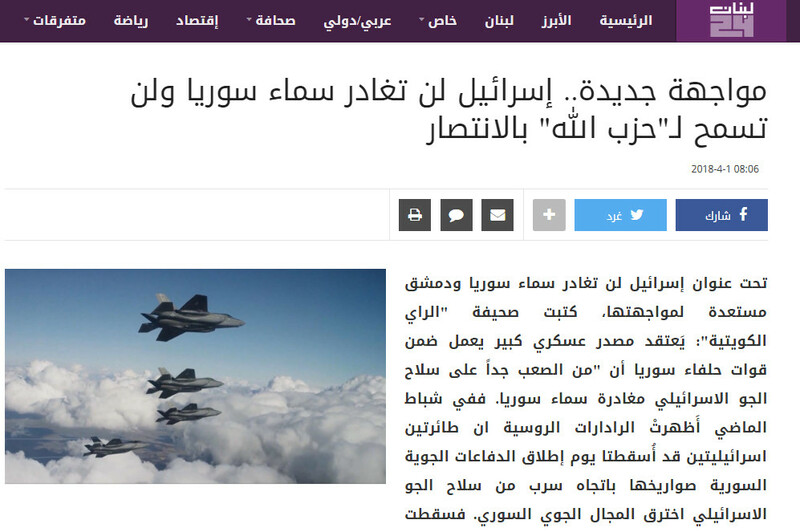 The Lebanese article quoted above is referring to a most recent confrontation between Israel and Iran on March 25, 2018, when such F-35 fighter jets had allegedly "undetected" entered Iranian air space and approached Iranian nuclear sites. In the following days, Russia had denied that such thing could really happen. 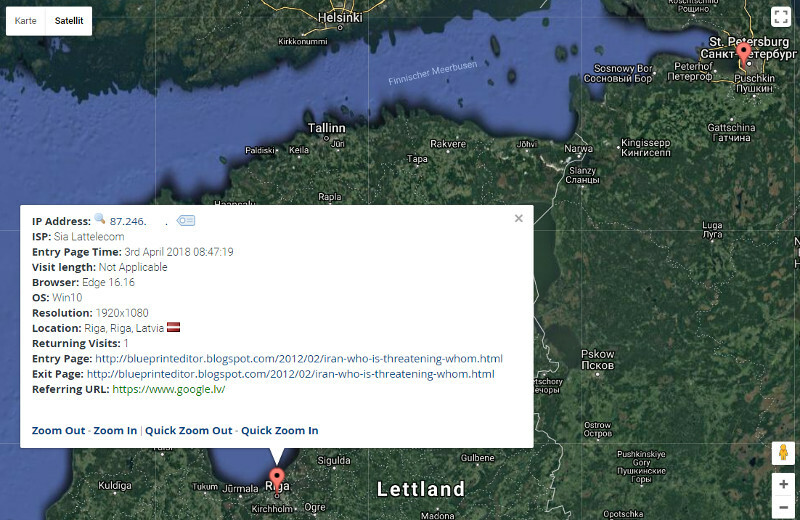 For more information read my related blogspot from March 30. 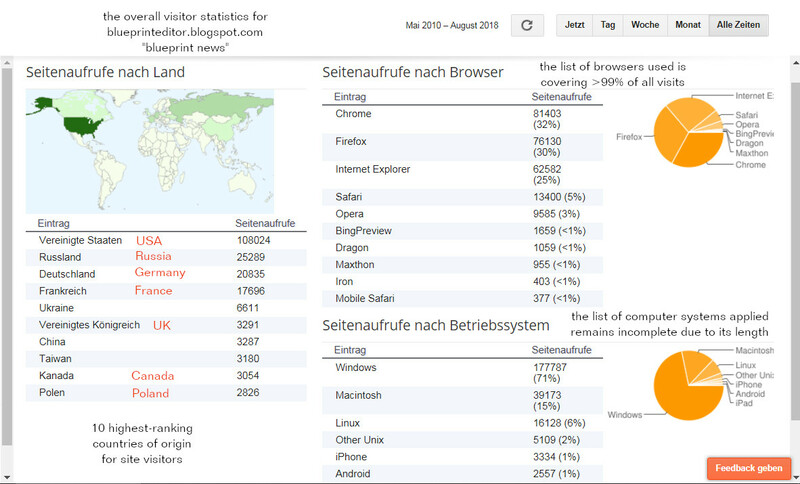 Visitor from the Baltic states in Eastern Europe interested in Iran.